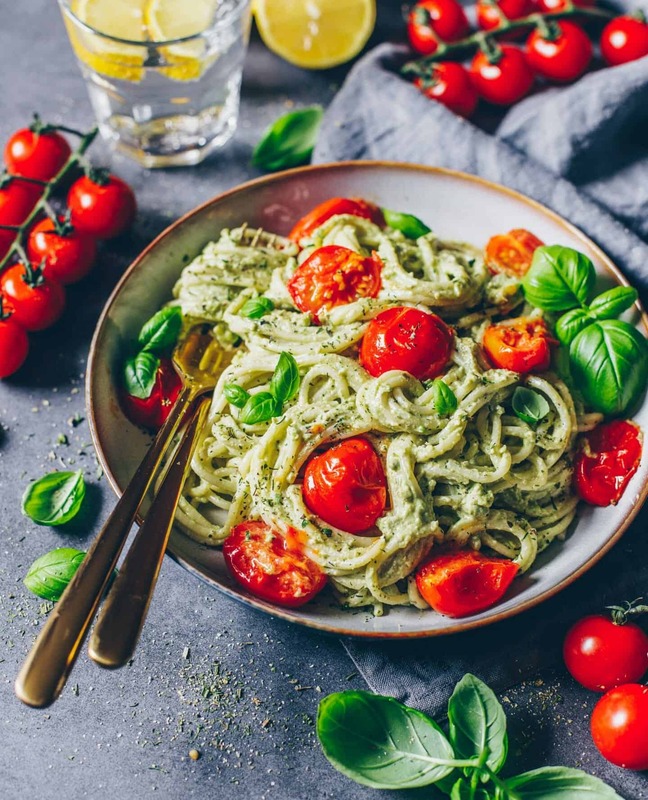 The best Avocado Pasta! So easy and quick to make – vegan, dairy-free, super creamy and so delicious! A perfect meal for busy people! 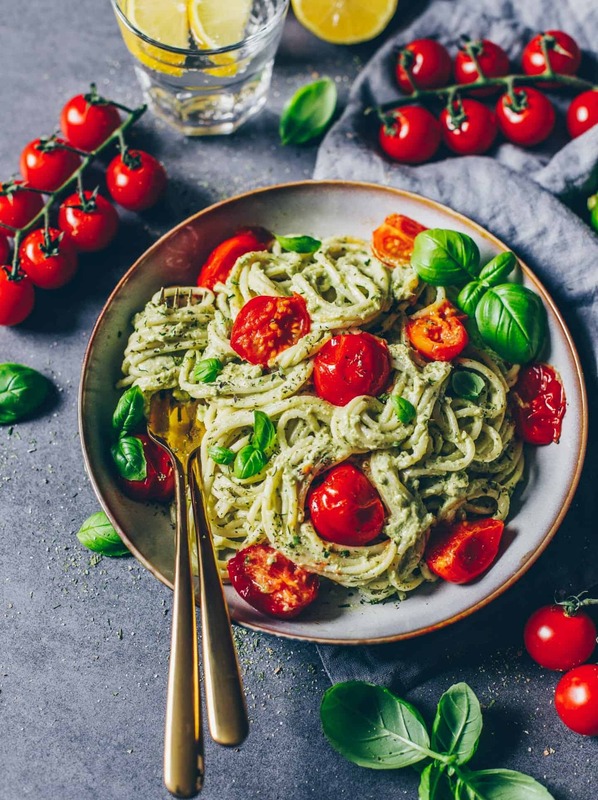 The best Avocado Pasta! So easy and quick to make - vegan, dairy-free, super creamy and so delicious! A perfect meal for busy people! Meanwhile, strip basil leaves, wash and chop them. Cut avocado in half, remove the core and scoop out avocado with a spoon. Blend or mash all ingredients for the guacamole and add salt, (nutritional yeast) or other seasonings to taste. Add a little bit of plant-based milk until desired consistency. Also, add cashew butter, if you like. As soon as the pasta is 'al dente' pour off the boiling water and rinse with fresh water. Roast pine nuts in a pan without oil until goldenbrown. Combine pasta with guacamole and serve in a pasta bowl with peas, tomatoes and roasted pine nuts. The quantity of basil is not specified in Ingredients section. Yes you can choose as desired. Made this tonight. It was perfect and by far the creamiest. Thank you! 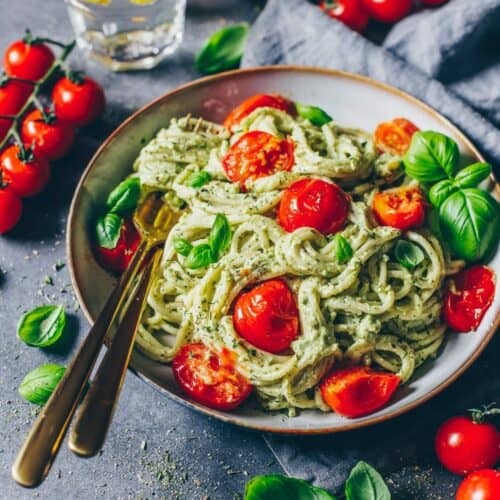 Hey this recipe looks great but just a question, this would end up as a cold pasta but I want to know if I can possibly have it as a hot pasta; I don’t know if transferring the guac and pasta into a saucepan will ruin the texture or something like that! You can try the recipe also with hot pasta and you‘ll see if you like it ? It looks divine! So creamy and beautifully green!!! I love that it’s made of avocados as those are my favorite! I cannot wait to make it! I make it so often because it’s super easy to make, delicious and healthy. This was absolutely delicious! So happy I tried it. A new favorite pasta 😍👏🏼 it worked really well with a gluten free alternative. So happy that you like this recipe so much. Tried this recipe today and it’s so yummy! And also very easy to make. Love it! Definitely going to do this more often. Tried your recipe and I love it! The avocado is so creamy. Thanks for sharing! Super super easy and looking amazing on plate! When my friends saw it, they said I’m MasterChef hahahah! Great recipe!!! I dont usually like avocados but tried this recipe and everything compliments them perfectly! So easy to make too, very tasty! Are the tomatoes cooked? Where do you find cashew butter? Can you use vegan butter?